Maxitec has introduced a new compact, high-performance servo electric turret punch press, E5 Compact Express, with fully automated material handling capabilities. 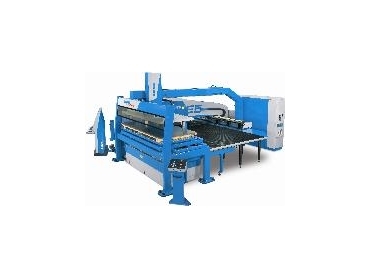 The E5 Compact Express is a multi-purpose machine for bending, forming, tapping and marking for sheemtetal fabricators. With fully programmable punching and upforming stroke (NC-axis), the E5 Compact Express from FINN-POWER is available with a 20 ton and a 30 ton punching force. For economic operation, the E5 Compact Express has low electric connection (connection power is 15kVA (3 x 20A), consumption (average power consumption of 5kW) and maintenance costs. Compact size and small foot print make it easy to place in every facility. The E5 Compact Express is suited to small fabrication shops wanting to introduce some level of automation. It can be easily worked in manual mode just like any conventional turret press. Ease of manual loading is enhanced by the availability of 4 positioning pins ensuring optimal operator ergonomics. Unloading of processed components is semi-automatic. The E5 Compact Express places the components in a freely programmable position on the table thus making the operator’s work much easier. During automatic operation, sheets are loaded from a loading table to the clamps of the E5 Compact Express. Double sheet detection and centering are performed for every sheet. Ready sheets are unloaded using a moving table and is carried out simultaneously while the loader is loading the next sheet. Processed sheets can be stacked on an unloading table, which is located below the moving table and is adjusted automatically as the sheet stack grows. Raw material can be added and unloaded sheets removed while the machine continues to operate. Material flow to and from the machine is from one direction, its loading table works at optimal operating height, it has large loading sheet stack capacity of 350mm stack height and 3,000kg stack weight. Sheet separation magnets, corner lifter on loader gripper to separate sheets, air blow to separate sheets, 32 suction cups and eight suction areas to ensure a good grip for different sheet sizes, maximise automation and safety. A sheet measuring device detects double sheets on gripper, sheet centring ensures correct positioning of the sheet, and a fast loader axis has an inverter driven electric motor with brake. With integrated unloading in the machine table, a scissor table is provided for optimal height for unloaded sheets. The unloading capacity is at 400mm and 3,000kg. There is uninterrupted machine run during material changes, several combinations of manual and automatic operations are also available. One machine side is always available for temporary manual loading and unloading. Raw material sheets are loaded by using pneumatic suction cups in gripper. Gripper movements, horizontal and vertical, are actuated by electrical motors with brake and inverter drive. This provides fast and accurate sheet loading for all purposes. The loading table has 300mm movement out of its position to provide easier positioning of sheet stacks. Sheet separation is ensured by using a three-way method. Magnets in loading table separate sheets on the stack, a corner lifter in a gripper removes double sheets, and air blow secures separating function. Double sheets are detected in every loading cycle to ensure uninterrupted loading cycle and machine function. In the sheet squaring sequence, every sheet is squared to ensure optimal sheet position and loading accuracy. Sheets can be used from edge to edge and quality of all production is excellent. When the sheet has been processed, it is placed on a moving machine table. The moving table delivers the sheet, skeleton and parts to the top of the unloading table. Parts and skeletons are pushed to unloading table, while the moving table returns to its normal position. The unloading table with scissor movement provides optimal unloading height for all parts and skeletons. Placing of the automatic loading and unloading unit makes it possible to use several combinations of automatic and manual loading and unloading cycles. The manual loading table is free for use for manual loading and unloading. The E5 Compact Express has the capability or long-term unmanned production cycles so it can be used for a ‘lights out’ operation or to allow redeployment of personnel to other duties during this automated process.